Samsung makes a new generation of DynaFlat HD Televisions. Technological obstacles have been overcome to present a flat image to the viewer that has virtually no picture distortions from reflections or glare. DynaFlat HD is dynamically changing the viewing experience. Samsung raises the bar by taking any standard video and upconverting it to a progressive scan, ""flicker free"", 480p display. Everyday TV just got better, but that is not all. The TSL3294HF is also capable of meeting the challenge of new digital television formats. I love this TV have had since 2001 and just now only having problems with it but i think that came from the move in Feb. I now just keeps coming off and on when i turn it on but I'm hoping to fix this soon. Picture, price, quality, and the TV even looks cool! SVM doesn''t help picture, my unit has a slight geometric curve at top of image. I was all ready to buy a Sony Wega 32" HDTV and was just trying to get the best price, when I saw this Samsung unit side by side with the Sony at Sears. The Samsung picture was every bit as clear, and was even brighter than the Sony. The best part was the $600 lower price tag. It also has a widescreen mode for viewing animorphic DVD, that the salesrep told me was not available in the Sony (I can''t independently verify that lack in the Sony, but can verify that it exists in the Samsung) I do not have any HD source since I have had this unit, but it looks great with DVD and produces an excellent picture from standard analog cable TV. I agree with many of the Samsung users at www.hometheaterspot.com that it is best to disable the Scan Velocity Modulation. Other than that, my only complaint is a slight geometric curve in the top of the image when in widescreen mode. Perhaps this is adjustable. PRICE!!! Great progressive DVD playback! That price is correct folks. Samsung sells directly to the public their b-stock AT WHOLESALE! Not a refurb or return, a BRAND NEW TV!! Best of all there is NO tax and they have a shipping arrangement that allows them to ship ANYWHERE for $50. Total cost to my door was $900 for a brand nwe TV that retails for $1499!!! Email me for info!! The picture is stunning when paired with a good progressive scan DVD player. Normal cable signal is average at best (same on most HDTVs) but video games look great (PS2 is a little sharp but XBOX is FABULOUS!!!). This is also a very attractive TV with a decent remote. More inputs would have been welcomed and the side by side 2 tuner PIP is GREAT!!! Everybody including Consumer Reports says it is great. I just got it last night but the cable channels and the DVD picture is not quite what I thought it would be. I don't know if the picture tube has to break in or whatever but the extra crispness really brings out the flaws in the signal or whatever. I really would like some feedback from you guys who have had the tv awile. Does the tube have a break in period. With my progressive scan toshiba dvd player, shouldn't I get outstanding pictures? Picture quality. Bang for buck. Ease of use. Easy to hook-up. Why pay for a namebrand when you can actually pay for a quality product? I was extremely eager to purchase a Sony Wega because of all the hype I read online and because of the ratings in Consumer Reports. HOWEVER, I noticed the Samsung immediately among all of the display TVs (which, ironically, was shelved directly above the Sony Wega). I never read a word about the Samsung line, so I was reluctant at first to purchase this set. BUT my gamble paid off! The picture is so unbelievably crisp, rich with color (unlike the disappointing Wega). This is hands down the best television I have ever owned. And the price is $500 less than the non-HDTV 36" Sony Wega. Samsung will indeed make a name for itself with this product line - and their name and product will be worth every penny! This is an excellent TV. I compared to Sony and opted for this one to save $300. I'm glad I did. It's everything I wanted it to be and it looks very very sharp. Audio is very nice even without a surround sound system. I use this TV in my room just for DVD movies and it looks great. I have a Toshiba SD-5700 from Good Guys for $299. I hooked up a PS2 to it and all the games on it are too sharp with S-video even when the Sharpness is set to 0. If you're looking for a HDTV but doesn't want to send over $1400 this is the set to get. It is big for a bedroom but not too big that it'll take up the whole room. 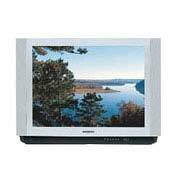 The TV has 3 view modes: Wide, Normal, and Zoom and it has 3 gray colors: Normal, Warm and Cool. Lots of audio features too like Dolby normal, wide, and phantom. The User can also adjust the center and rear volume. Easy to use remote and easy to program. nice hot keys on remote for changing settings from custom to standards or mild. The TV also hold brightness across the TV at the same level unlike the Wegas. Holds black well but not perfect. It's a better TV than I thought it'll be. I don't spend $1300 easily, but this is a very good buy for the money. Picture quality easily beats the non-HD Wega's. Plus you are not paying the extra price for the Sony name. I've paired my set with a Samsung Progressive scan DVD and am still amazed every time I watch a disk. This TV is hard to find on sale, so go to Sears when they have a 10% of everything sale (about once a month). From what I can tell there are no differences between this set and the 3293HF or the 3295HF also badged "Tantus."